After a year of challenges and extensive development, we are excited to unveil the eosfinex beta. The smart contract behind eosfinex has been developed internally and has been audited thoroughly by the EOS Argentina team. An official bug bounty outline will be presented in the coming days upon which users can structure their feedback — in the meantime, our developers await your feedback on the eosfinex Telegram! 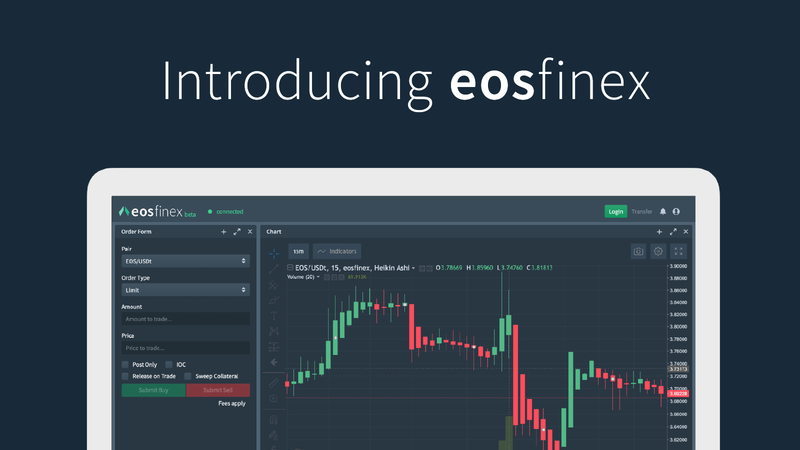 Developed by the Bitfinex team, eosfinex combines the scalability and speed of EOS with Bitfinex’s industry-renowned expertise to deliver a fast, transparent and secure platform for digital asset trading. eosfinex brings all core exchange components on-chain, including order books, matching engine and custody solutions. eosfinex was announced in February 2018 with great expectation, and we are thrilled to now be able to showcase our work. It’s been a year full of challenges, but we couldn’t be more excited for what’s to come. We’re eagerly awaiting to see how the EOS ecosystem interacts with the platform and we greatly look forward to launching the fully-functioning version in the near future. To help get you started, a range of tutorials and walkthroughs are available here. Any questions? Stop by the eosfinex Telegram for support. eosfinex is a high-performance decentralised exchange built on EOS.